I made the Ginger jeans from Closet Case Files after taking their Sew Your Dream Jeans workshop (you can read my review of it here). The course came with the new mid rise Ginger jeans pattern which I altered to be the high waisted version. It’s easy enough to do and even Heather Lou herself said to just alter it instead of purchasing the high waist version! 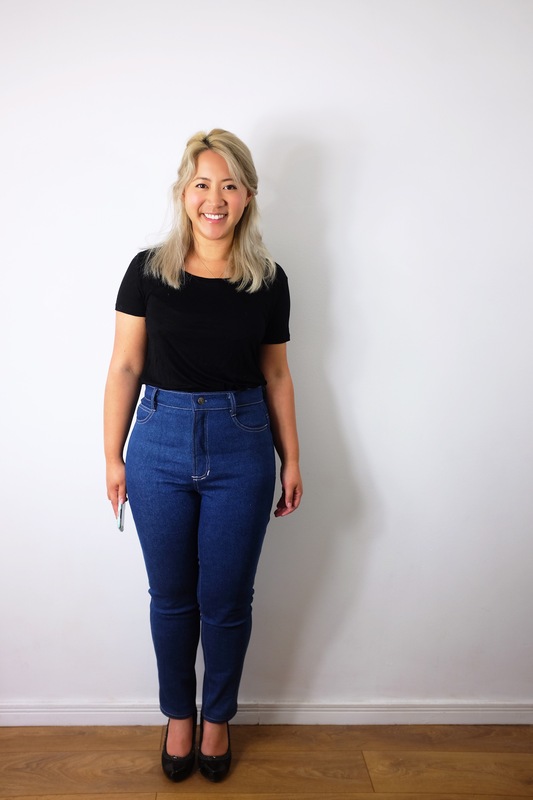 I bought my denim from Fabric Dreams – they’re a German company that is recommended by Heather Lou for good quality denim. I got myself lots of samples (they will send you 3 free ones) before making my purchases from there to make sure I got what I wanted! Delivery to the UK was £8.95 or free is you spend over £75. The one I’ve used here is one of the stonewashed ones that doesn’t have a photo. Sometimes it’s worth just taking a shot a getting a sample just in case (they’re free anyway!). With the pattern, I decided to go with a straight size 12 which fitted my hip measurement and go from there in terms of fitting. The basting and fitting stage was so important for me because I knew I’d have to make a lot of changes! I ended up taking it in a lot at the waist and through the hip, doing a sway back adjustment, a low seat adjustment and some crotch length changes too. It’s all lots of little changes – a 1/4″-3/8″ alteration here and there – but it makes a HUGE difference to the overall fit! 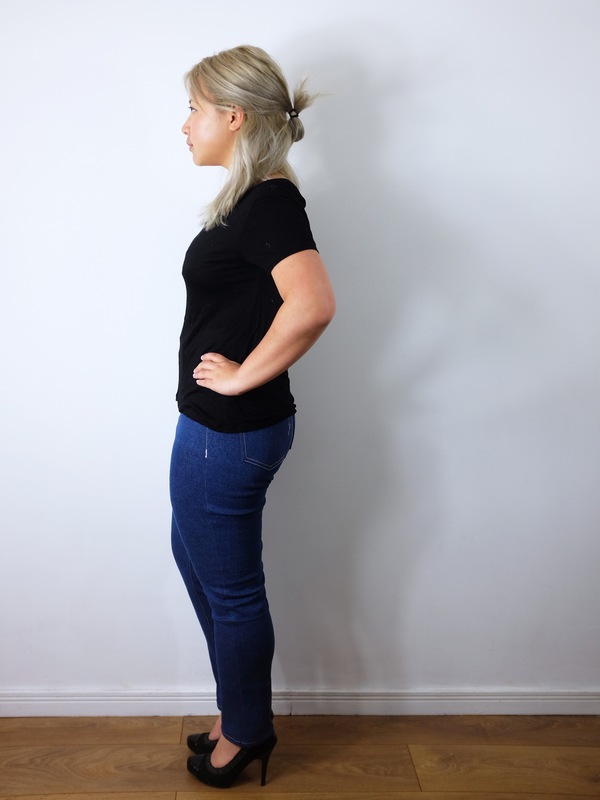 I think after making the Morgan jeans and taking the online class, it all seemed to make so much sense so it all went pretty smoothly. The most time consuming part was having to switch over between my regular sewing thread and the top stitching thread all the time. That made me really wish for a second sewing machine! So here are my Ginger jeans AKA the first pair of jeans which I’ve put on and it’s fitted like a dream! It’s still pulling a little above the calf. I’m not sure whether to bother with a full calf adjustment or not as it doesn’t feel tight it just creates lots of wrinkles at the back of the knee. I added a little bit of interest to the back pockets with the topstitch lines crossing over on one side. I’m a total jeans making convert. Be prepared for a ton more Gingers coming your way! 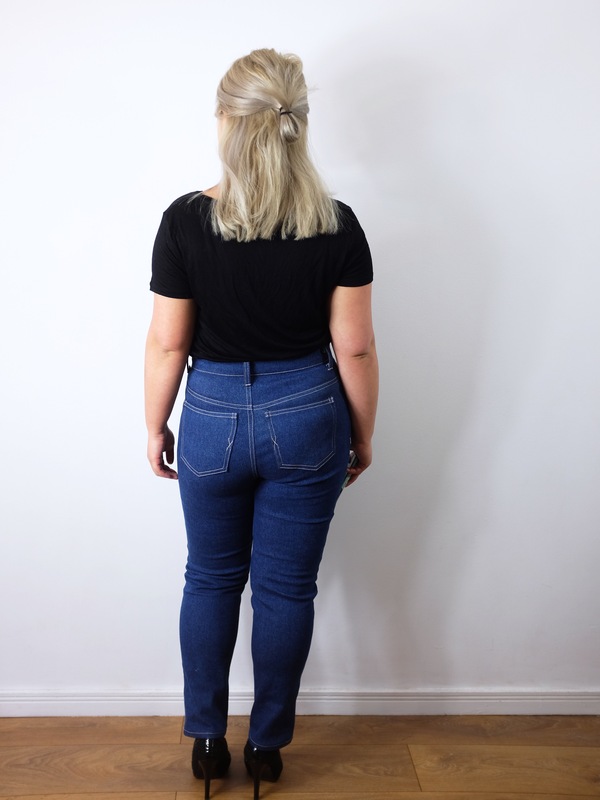 I love the idea of making jeans and Gingers are top of my list, it’s a big investment though, the course and pattern plus material but my favourite rtw jeans aren’t being made anymore so maybe it’s time. Yours look amazing!! They fit like a dream and your top stitching looks perfect. That was what prompted me to make mine too! I used to only buy Levi’s but they changed their fit and their denim and now their stuff is just rubbish. You should definitely give it a go at making them! I’ve actually found that making them is coming out a lot cheaper than I thought they would as well. Because I’m short I use a lot less denim… Lol. These are perfectly fitted! It seems like the course was well worth your while. I LOVE these! I’ve bought the class too, I just need to find the time to make them! Thanks! Haha, time is always against us! Seeing your jeans sent me flying immediately off to sign up for Heather Lou’s course! They are such a perfect fit and all of a sudden the possibilities of what I could do with this idea of making my own jeans exploded in my brain 🙂 I was out hunting yesterday for jeans and came home completely discouraged. 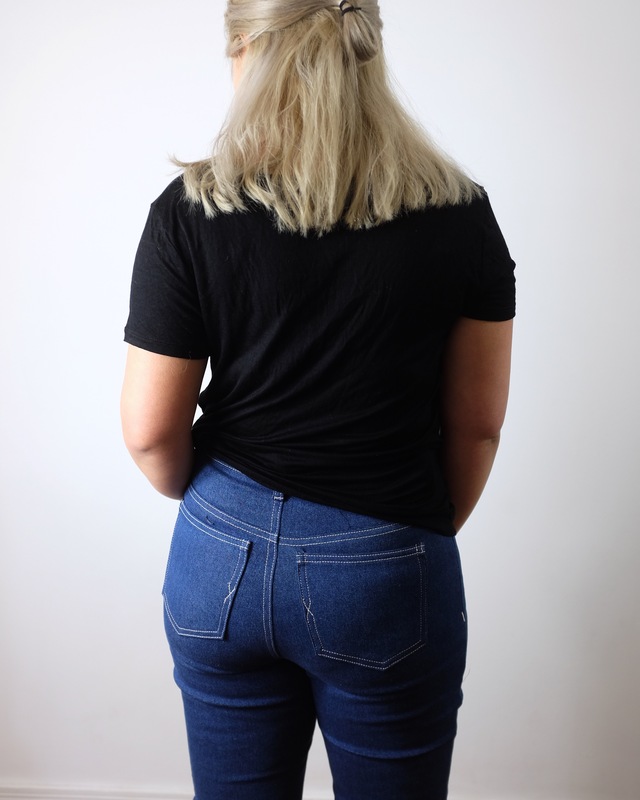 Finding the right fit I knew was going to be impossible…I’m 62 years old – I’m fit (swimming, pilates etc) but I still have an older woman’s shape with larger waist, flat bum and skinny thighs (sigh!) so jeans end up slipping off my waist and get super baggy in the wrong places. I’ve had the Closet Case files jeans pattern for more than a year and Heather Lou’s ebook as well (printed off and on my shelf!) but I’ve always found video instruction so much better BUT with ALL of it in my arsenal I should be well prepared to take this project on. Not just making jeans in denim but in all kinds of fabric – I have a fantasy of several pairs of great jeans in light denim, distressed and stretch flowered prints 🙂 So thank you for posting this great inspiration to get going! You’re welcome! I always have that awful jeans shopping experience too – I swear jeans only fit perfectly straight thin models nowadays. I hope you enjoy the course as much as I did. It was definitely worth it for me in order to get really great jeans! These look fantastic! Congrats on getting them fitted so well. I’m working on trying to better fit a pair of pants now. I’m making slow progress. It’s got great advice on fitting any pant – not just the Closet Case ones! Thank you! I’ve actually already got denim for 2 more! I’m such a keen bean sometimes! I made Gingers for my #wardrobebuilder project and love love love them! I like the topstitching details you have on the pockets… Something for my more adventurous next pair! It’s a great pattern! It’s definitely suited for your #wardrobebuilder project – can’t have a wardrobe without good jeans! This was my first time trying anything fancy with topstitching. It’s fun to do though! It’s a great way to make them individual! These jeans are too damn good! I love your top-stitching detail. I actually just bough some denim today for the exact same pair (mid-rise version). Here goes nothing! Thank you! I’m sure yours will turn out well too!! Wow great job! I still have yet to make a pair of jeans I’m satisfied with. Thanks! I’m sorry your haven’t been that successful yet. Jeans aren’t the easiest make. I think it’s worth persevering with it though!